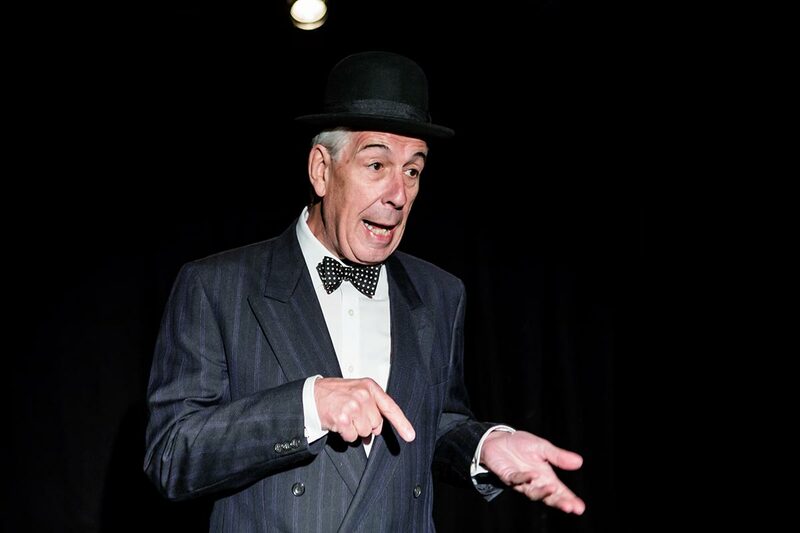 Ahead of his month long stint at the Edinburgh Festival in August the actor Jeffrey Holland found time to talk to me about his one-man show which comes to Kettering Arts Centre in September. 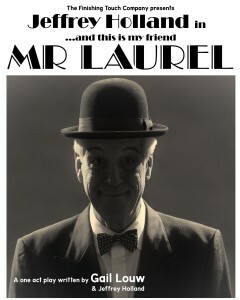 In, …and this is my friend, Mr. Laurel, he plays one of Hollywood’s most endearing comedians from the era of the black and white films. It is a long way from the insecure person who was introduced to the physical world of acting at the age of 16. Jeffrey and his friend Peter attended a church youth club but both were looking for something else to do. It was Peter who suggested they should join the local dramatic club, the Co-op drama club, in Walsall, for under 21s. Recalling that moment in time Jeffrey remembers exclaiming – “What? Do you mean act?” He considered this to be an outrageous suggestion but the drama club soon found it had two new members. Now, a few decades on, Jeffrey is getting to play his hero – Stan Laurel in the one-act play he co-wrote with Gail Louw. It has been delighting audiences across the UK since its debut performance in 2013 and which played to packed houses at that year’s Edinburgh Festival. The play was two years in the making following the extensive research undertaken by the dedicated actor. It meant sitting through hours of Laurel & Hardy films (no hardship for the devoted follower) and reading copious numbers of articles, reviews and insights about the comedic duo who delighted, and still do delight, so many people. In the play Jeffrey pays homage Laurel and Hardy, at some points taking on both roles. It is set in the bedroom of Oliver Hardy who is unable to move or speak following the stroke that would ultimately lead to his death. Maybe not the most obvious scenario but it allows the audience to be drawn into the lives of cinema’s iconic comedy movie pairings. It is a riveting play but being in a one-man show has its perils as Jeffrey found out to his cost in the debut performance at the Camden Fringe. Being on your own on stage the actor said you have to give yourself mental cues, an image if you will, that will lead you from one paragraph to the next. Forgetting a line, known in the industry as freezing, happened once, but never again, when a member of the audience laughed at one particular line in the play. There are plans underway for a biopic of Laurel and Hardy and while Jeffrey would relish the part he is convinced producers/directors et al would go for a more convincing lookalike than himself. He is no stranger to the screen and counts himself very fortunate to have been living in the era of shows penned by David Croft and Jimmy Perry. Jeffrey may be remembered best for his role as Spike in Hi-de-Hi (specifically written with Jeffrey in mind) but for him, his favourite character was James Twelvetrees in You Rang M’Lord. “It was a fabulous part,” he said: “it was a huge lot of fun. He was the biggest snob in the house, it was a straight role in a comedy show. Although equally at home on television and radio, for which he said you don’t need to learn lines or wear makeup, Jeffrey’s true passion is for ‘live’ theatre. It is the adrenalin rush when the house lights go down and the stage lights fade in that brings out the real actor. This ‘real’ actor has trodden the boards from repertory companies and touring productions to the West End. This has landed him serious parts in Shakespearian plays, lighter roles in comedy and versatile parts in musicals as well as being a regular cast member in pantomime – Jeffrey is listed as being one of Britain’s top five Dames. He said: “I think most actors will say that being on stage is best. It’s a great leveller, you need some ability and a bit of luck but I am fortunate to be doing the job I love and making a living at it. If I wasn’t doing this I don’t know what I’d be doing. When I was still at school I had a small job in a wine merchants where I learned all about the different grapes and colours, which was fascinating, so I might have become a wine merchant myself but I have always loved what I am doing now. If you want to know more about Laurel and Hardy and the chemistry between the two friends – …and this is my friend, Mr. Laurel – is for you, and it comes to Kettering Arts Centre on Saturday, 12th September. Access our event page here.